One can only imagine Kathy Mock's surprise when she glanced out the window of her Akron home, and saw a snow-white raptor winging by. In this winter/spring especially, thoughts of Snowy Owl would come right to mind. Kathy was laboring at the computer when she caught a glimpse of this thing cruising by about two blocks away. She didn't tarry, rushing to grab optics and camera, and took off outside to track the ivory bird down. That she did, and obtained these distant but nice images. Snow White turns out to be a gorgeous, highly leucistic Red-tailed Hawk. Vestiges of red tail feathers can be seen bleeding through, as can some dark pigment under the wings. This bird would make even a nonbirder whirl around and do a double-take. Leucism is a pigment anomaly that causes normally dark pigments to become washed out and pale. I've written about this condition in more detail in other posts, such as HERE, and HERE. Thanks to Kathy for sharing her interesting find! After the long, brutal winter, the spring explosion of frogs has been especially welcome. March is the transitional period when Mother Nature struggles to throw off the shackles of winter. Bit by bit, the days lengthen, and warm and icy waterscapes thaw. The frogs aren’t a species to be contained. With even the faintest hope of open water, frogs emerge from hibernation and set to song. Leading the charge are Western chorus frogs and spring peepers. 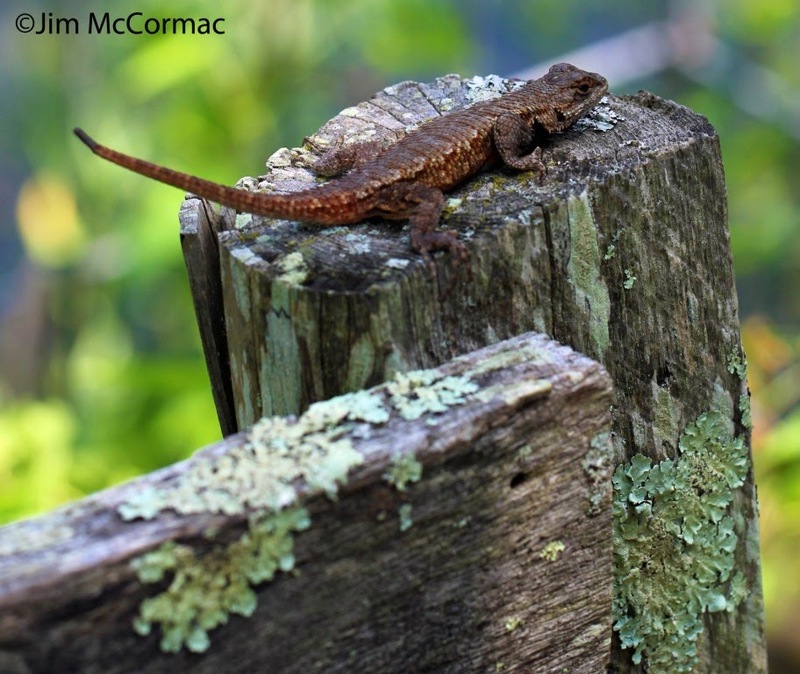 The two species create a distinctive wall of sound in our wetlands. The tiny peepers’ shrill birdlike whistles fill the air, and a vociferous pack can be heard from great distances. 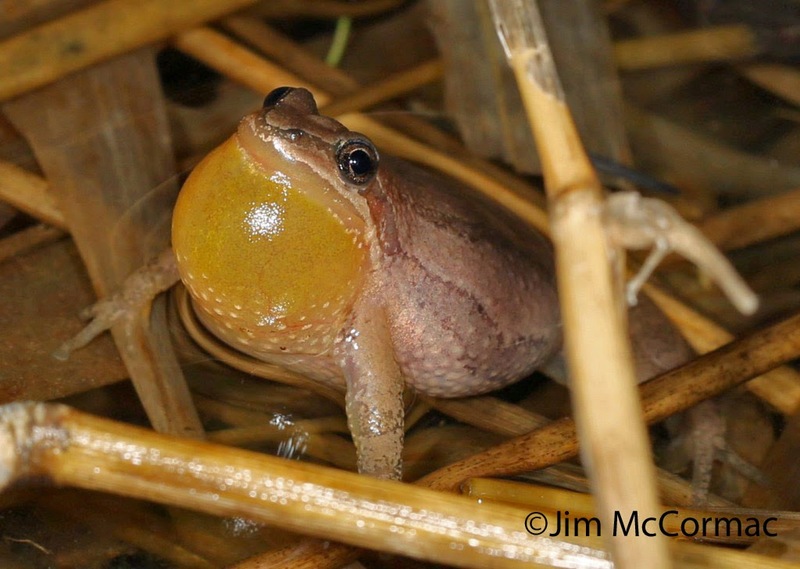 Mixed with the peepers are the distinctive throaty notes of Western chorus frogs. The male puffs his elastic throat pouch to impossible dimensions. It is as if the inch-and-half amphibian has swallowed a golf ball. When fully engorged with air, the pouch looks about the same size as the frog. Once primed, the frog issues a guttural creaking aria often likened to the sound made by running a finger down the teeth of a comb. Remember that metaphor and you’ll never mistake the chorus frog’s song. Air temperature influences the speed of the frog’s song. On a warm evening, its notes zip along speedily. In cooler weather, the cadence slows significantly. If the thermometer dips into the 40s, the song barely sputters along, and individual notes can easily be discerned. Successful songsters attract females, and the amorous couple locks together in an embrace known as amplexus. The freshly fertilized female then deposits gelatinous egg clusters on aquatic vegetation; each cluster contains as many as 300 eggs. A week or so later, tiny tadpoles burst from the eggs. About two to three months after hatching, the tadpoles metamorphose into frogs and leave the water. Except during the spring breeding frenzy, Western chorus frogs typically live on land and are hard to find. April is the peak month to take in the spectacle of frog mating orgies. 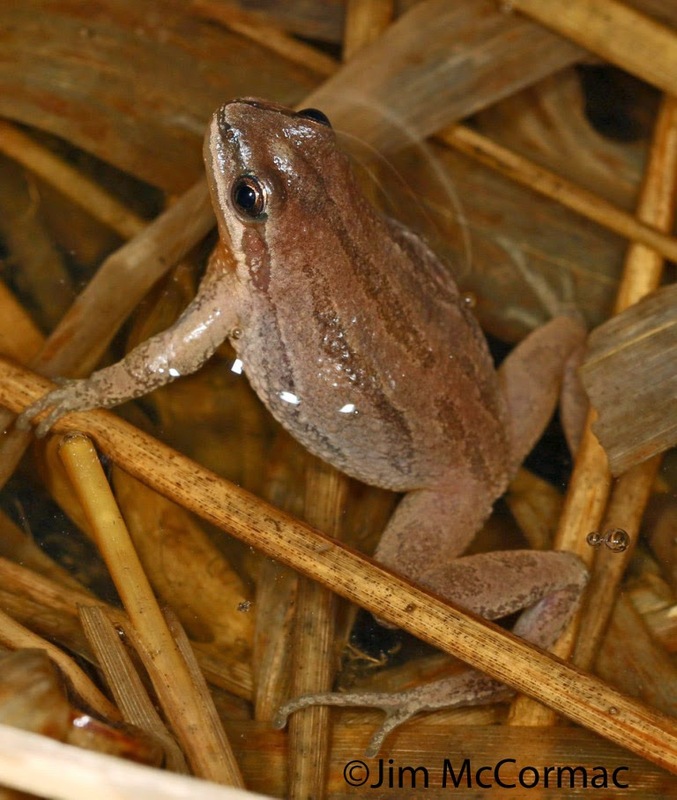 In addition to the chorus frogs and spring peepers, several other species can easily be found. They include American bullfrog, green frog, and Northern leopard frog. American toads are often part of the scene. All of these amphibians are common in most of the state. Franklin County Metro Parks support many fine amphibian habitats. 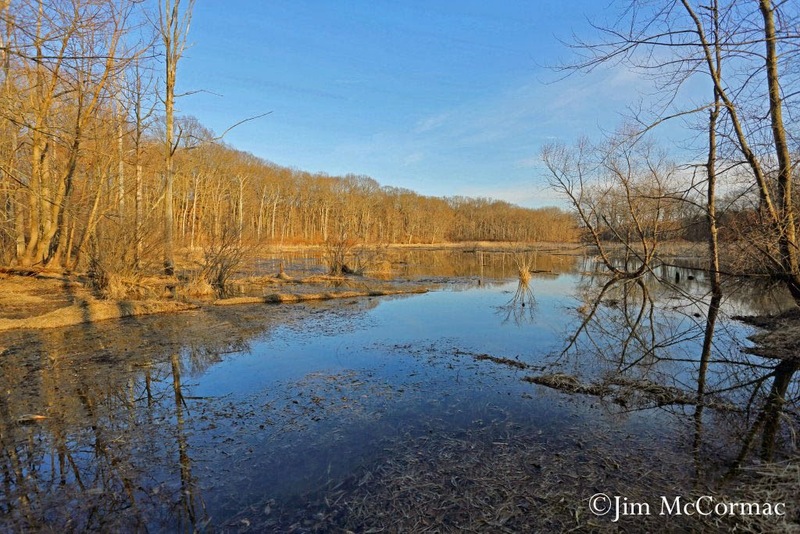 A “Secret Swamp” hike will be held on April 5 at Slate Run Metro Park, and a “Frog Frenzy” program will take place on April 19 at Prairie Oaks Metro Park. Both should produce plenty of frogs. For more information, call 614-891-0700 or visit www.metroparks.net. The stunning Northern Parula is one of at least 20 species of warblers attendees can expect to see. Mark your calendars for the weekend of April 25-27, if you haven't already done so. That's the weekend of the Ohio Ornithological Society's 10th annual conference, to be held at the state park lodge imbedded deep within Shawnee State Forest in the rugged hills of southernmost Ohio. If you've never been to Shawnee, you're in for a treat. This is the largest contiguous forest in Ohio at 65,000 acres, and it nearly connects with the sprawling 16,000 acre Edge of Appalachia Preserve just to the west. The biodiversity of this region is beyond incredible. Over 100 species of birds nest in the area, including specialties galore such as Chuck-will's-widow, Summer Tanager, and Cerulean Warbler. Want to see (or at least hear) Ruffed Grouse? This is the place. The sheer numbers of breeding warblers is staggering. A good late April morning might produce dozens each of Worm-eating Warbler, Louisiana Waterthrush, Blue-winged Warbler, Hooded Warbler and many more. Shawnee is THE hotspot for Cerulean Warbler, too. The OOS launched itself with our first conference in 2005, at Shawnee. It was a hit, with some 200 attendees. Exposure to this magnificent forest and its never-ending biodiversity set many tongues to wagging, word traveled, and our encore there in 2006 attracted a whopping 250 people. Sign on RIGHT HERE, you won't regret it. The conference is nice blend of programs and field trips. The agenda is RIGHT HERE. I have spent countless hundreds of hours in Shawnee and the Edge of Appalachia; the area ranks very high on my list of all-time favorite places. Not only because the birds are so lush, but also because of the treasure trove of other flora and fauna. 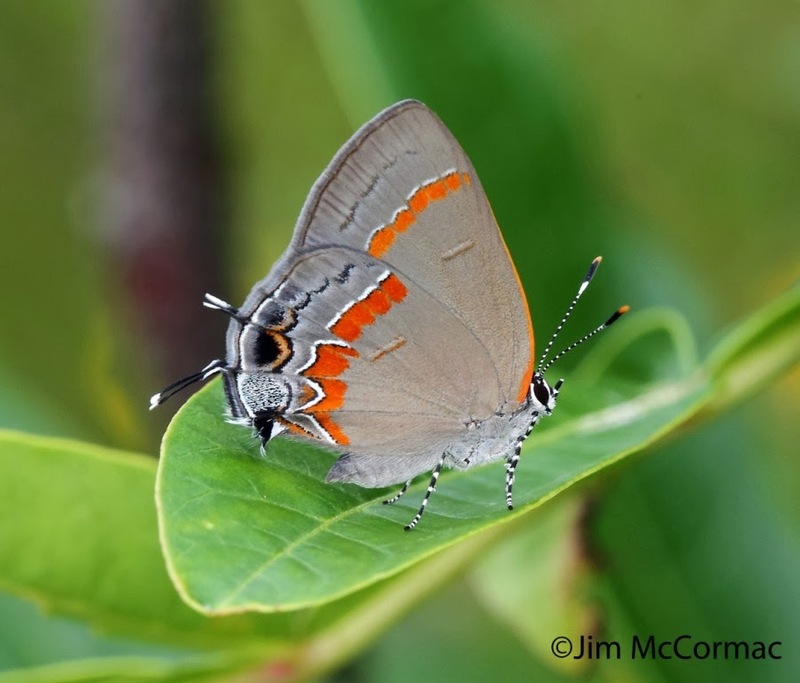 The gorgeous little Red-banded Hairstreak above is but one of a few dozen butterfly species that can be seen on a warm sunny spring day. There are around 1,000 species of native plants, which fuel plenty of animal life of all kinds. 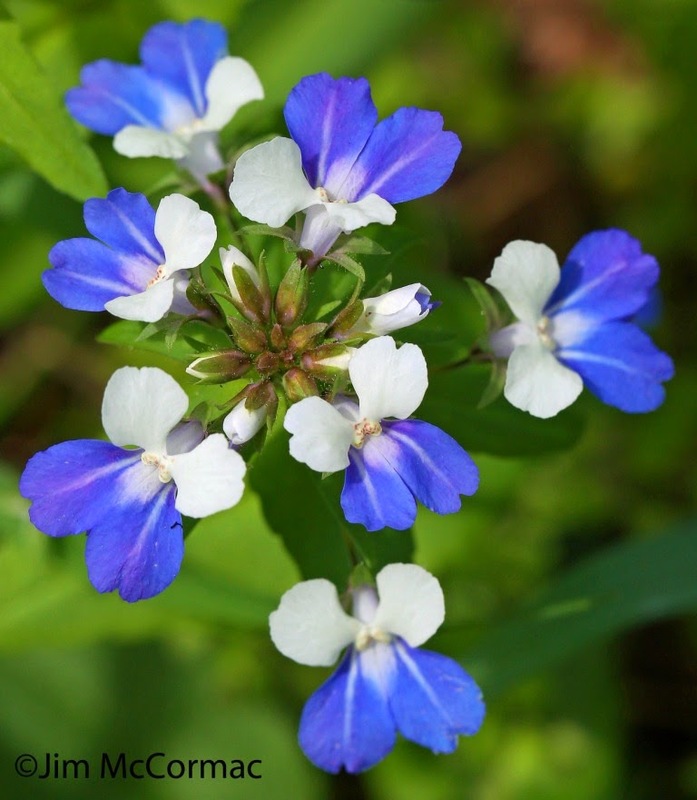 The flora is punctuated, rather liberally, by rare plants that are in some cases found nowhere else north of the Ohio River. Shawnee field trips are an absolute blast, and never boring. I believe I am going to take a group of adventurers out Saturday night into the depths of the wilderness. We will especially be after Eastern Whip-poor-wills and Chuck-will's-widows, but there's no telling what one might find in the nighttime forest. 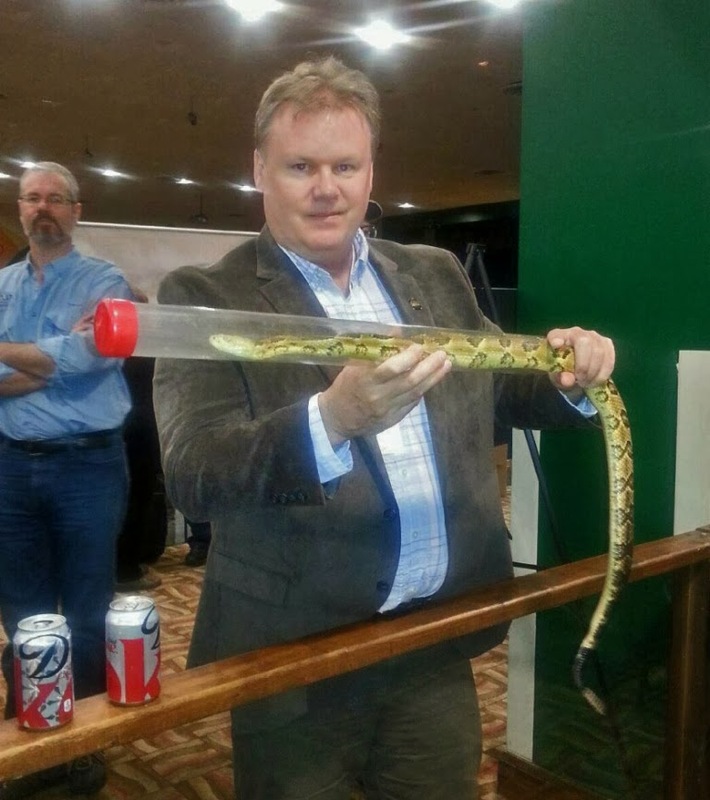 The OOS conference is a great way to get a jumpstart on spring. Down there, by late April, nearly all the breeding birds will be back in force - people in northern and even central Ohio will have to wait a few weeks to see most of these species, at least in any numbers. To register and for the complete lowdown, CLICK HERE. A Western Chorus Frog, Pseudacris triseriata, sits in a wet pool, the upper half of his body above the water. I should qualify the title of this post: First amphibians of the year (FOR ME)! This has been a brutal and prolonged winter, and even now, in mid-March, the frosty old man is reluctant to take back the snow and ice. Here in central Ohio, we've scarcely had any of the decently warm (50 F or above) rainy nights that amphibian-seekers pine for. It seems that the majority of frogs and salamanders have yet to make the vernal pilgrimage to the breeding pools, and individuals are just trickling in bit by bit - no massive migrations of yet. Last night was one of the few warm evenings we've had, but it wasn't wet. Dryness inhibits major movements of amphibians; they much prefer to move towards breeding haunts when everything is nice and soaked. Nonetheless, I knew that at least some Spring Peepers and Western Chorus Frogs would be in the wetlands, and I really wanted crisp images of the latter for an upcoming column. So, I headed to one of my favorite amphibian routes near Bellefontaine last night, stopping first to pick up Bellefontainite and amphibian enthusiast Cheryl Erwin. Sure enough, the peepers and chorus frogs were in good tune, but not in the numbers they soon will be. Just smatterings of individuals calling from wetlands where there should soon be many more, if the weather ever warms. This Western Chorus Frog is the same individual as in the first photo, just seen from another angle and while he was singing. The animal was issuing his guttural creaking trill regularly, counter-singing with another frog about fifteen feet away. Getting images of singing chorus frogs can often be a challenge. They seem to prefer staying towards the interior of their wetlands, and that means out in the deeper water. To capture this animal on pixels, I waded into water that soon threatened to overtop my knee boots. After spotting the animal from about fifteen feet, I slowly crept up while he sang. Then came the cold, wet part. I dropped to my knees to get down closer to my subject's level, and leaned in close. Getting, of course, soaked in the process and filling the boots. Someday I'll resort to hip or chest waders, but somehow getting as wet as my subjects makes me feel more a part of the whole scene. A giant Eastern Tiger Salamander, Ambystoma tigrinum, lumbers from the wet grassy verge of a large seasonally inundated wetland. We were quite pleased to find a few of these jumbos around one of their breeding haunts, but I don't think the majority have yet arrived. 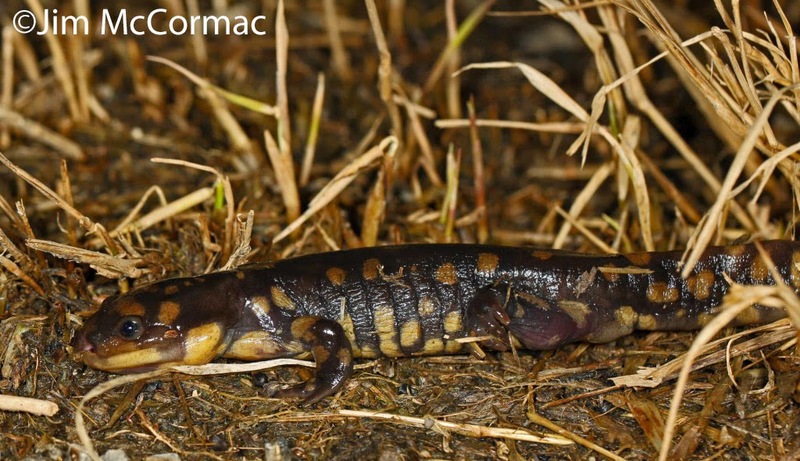 Tiger Salamanders prefer open grassy wetlands - not the wooded vernal pools of most of their Ambystomid brethren. The vernal emergence and migration of salamanders will never cease to amaze me, and I get out as much as possible to look for them. There are usually only a few good nights when temperature and moisture are conducive to mass movements, and I'll hope to catch a better night within a week or two. Fortunately, my favorite Tiger Salamander breeding site is along a road that floods out completely in a few spots, and has few houses along it. Thus, the vehicular traffic is almost nonexistent. Getting pancaked by cars is a real threat to these animals as they attempt to move overland to the wetlands. 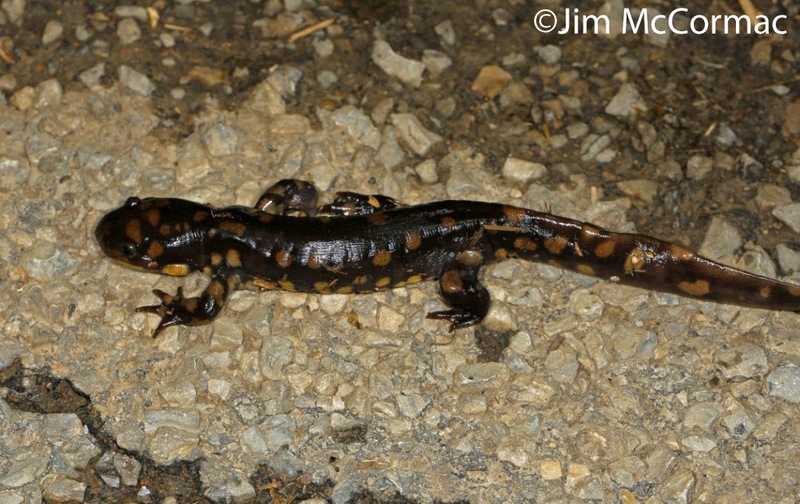 When development brings too many roads and too much traffic, the salamander populations are likely to eventually disappear. HENRY COUNTY: Extreme eastern part of the county, being seen along County Rd. M between the county line (Wood County) east to County Rd. 7. Thanks to Todd Heilman for the report. WOOD COUNTY: Near the intersection of Portage Road and State Rte. 235. This is about one mile SSE of the village of Weston. Thanks to Tammy Phares for this report. As of now, we stand at 177 owls reported, from 60 counties. If you don't hail from Ohio, we've got 88 counties, so that's a big chunk of them. And I wonder how many other owls were out there that never got reported. Probably lots. Anyway you shake it, the winter of 2013/14 will probably go down as the largest documented irruption of Snowy Owls in Ohio's history. Some of the invasions of nearly a century ago might have rivaled or exceeded this one, but the numbers were not well documented. And although we've seen our way through the brunt of the invasion, I'd be surprised if a few more reports don't trickle in before all is said and done. The map is below, and as always, I appreciate any and all reports and welcome new ones. Thanks to the myriad observers who found and reported owls. A gorgeous Red-necked Grebe, Podiceps grisegena, plies the waters of Funk Bottoms Wildlife Area in Wayne County, Ohio, last Saturday.This big grebe could rightly be termed a rare bird in Ohio, and all sightings are noteworthy. We get them every year, but normally in very small numbers. But not this spring.There have been dozens of reports of Red-necked Grebes in Ohio, from the Ohio River to Lake Erie. Anywhere there was open water, there was a decent chance that one of these swan-necked grebes could be found. I haven't attempted to add up all of the reports, but the number of birds must run into many dozens; possibly pushing 100. Without doubt, if it isn't the biggest incursion of Red-necked Grebes into Ohio (and throughout much of interior eastern North America), it is a near-record flight. "Some winter on the Great Lakes. However, distribution and size of winter population poorly known. 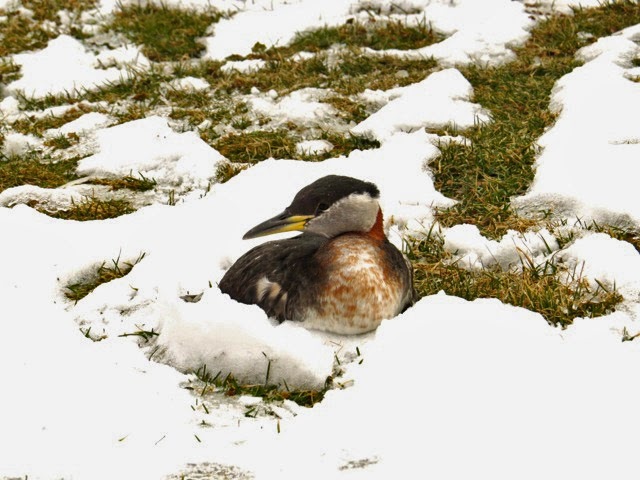 In severe winters, irruptions of Red-necked Grebes into inland and coastal areas south and east of the Great Lakes following freeze-up of the Great Lakes suggest that numbers of wintering Red-necked Grebes may range from hundreds to a few thousand individuals." (Stout, Bonnie E. and Gary L. Nuechterlein. 1999. Red-necked Grebe (Podiceps grisegena), The Birds of North America Online (A. Poole, Ed.). Ithaca: Cornell Lab of Ornithology; Retrieved from the Birds of North America Online). Of the birds that move east from the breeding grounds, the major flyway is right through the Great Lakes. My hunch, which is not exactly rocket science, is that far more of these grebes pass through Ohio than are ever detected, and I suspect that large numbers completely overfly our state. Red-necked Grebes are powerful flyers, and can cover long distances in a single flight. Furthermore, with few exceptions (such as great diurnal movements on Lake Superior in fall), the grebes migrate at night. Red-necked Grebes are prone to mistaking icy fields, roadways, and other reflective surfaces for water, and setting down on terra firma. Once grounded, they have no hope of taking off. The bird in this photo was found in a field in Holmes County. 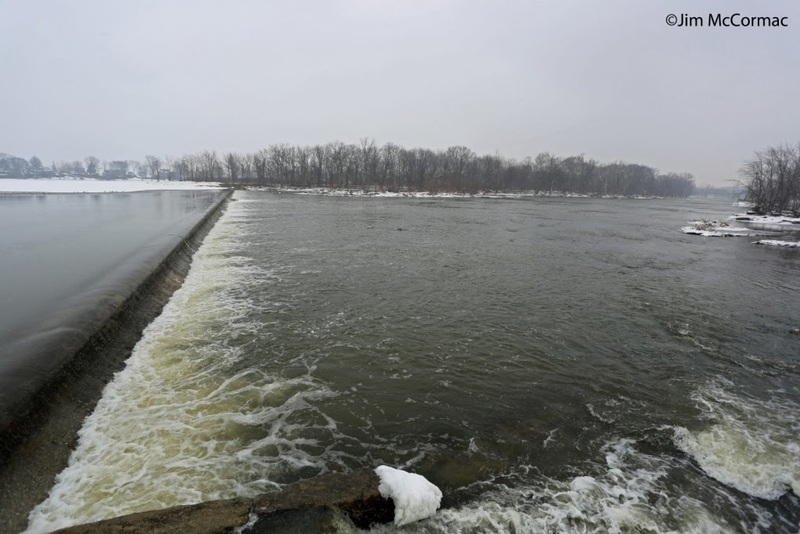 It was indeed fortunate in that Dennis Troyer and Robert Schlabach were alerted to its presence, and those gentlemen were able to see to its rescue and relocation to a nearby area of open water. Many grounded grebes are not as lucky, and mass groundings can cause significant mortality. An interesting question involving the grebe invasion is whether these are birds that were forced off the Great Lakes, or are spring migrants. We also were bombarded with record numbers of Long-tailed Ducks and White-winged Scoters, and I don't think there's much question that those two species were pushed inland by the near-complete freezing of the Great Lakes this winter. I wrote about those two HERE. However, the scoters and Long-tailed Ducks began appearing in numbers in January. With just a few exceptions, the grebes didn't bombard us until early March - well after the sea duck invasion had become established. Red-necked Grebes are early migrants, and that timing fits with their spring migration pattern. Perhaps they are birds that pushed north as usual from Atlantic coastal areas, encountered the deep freeze of the Great Lakes, and were forced to stage a retreat, thus ending up on open waters throughout the east and south of the Great Lakes. 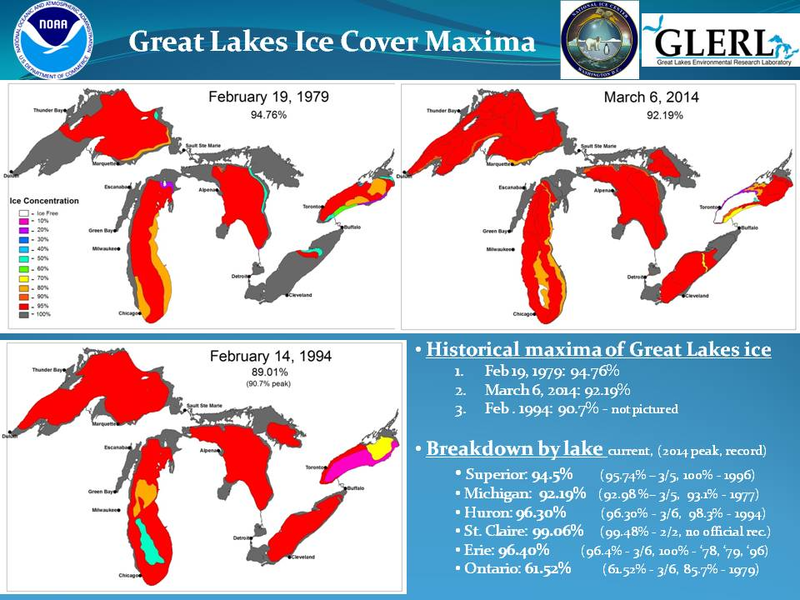 Winter ice cover on the Great Lakes apparently reaches its peak in early to mid-March, and it may be that changing ice conditions on Lake Ontario this month forced overwintering grebes off that lake and into inland areas. Whatever the reason, birders were thrilled by scores of Red-necked Grebes, and we'll probably have to wait some time to witness another incursion of this scale. The Red-necked Grebe invasion also provides another example of a species in which we have a less than complete understanding of its life history. Mark your calendars for Saturday, March 29th. That's the date of the now legendary Shreve Migration Sensation (SMS). This is the largest one-day natural history event in the state of Ohio, insofar as I know, and is always a memorable experience. Ground zero for the SMS is the bucolic Wayne County village of Shreve, population about 1,500. 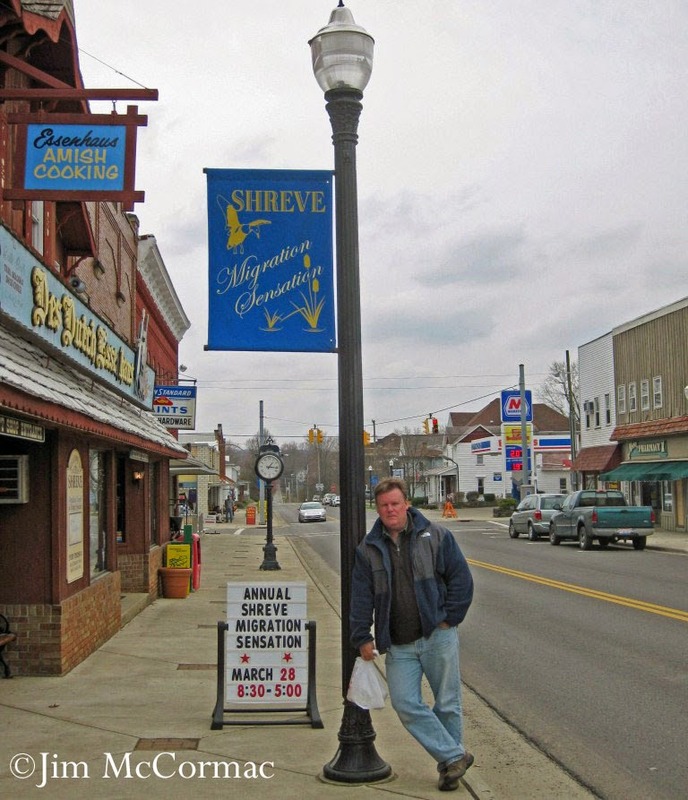 Your narrator is seen here, leaning against a downtown street lamp in front of the Des Dutch Essenhaus, a fabulous Amish restaurant. Indeed, I clutch a bag of freshly baked cookies with an iron fist. If you make the SMS, you must visit the Essenhaus. The village of Shreve nearly doubles its population when the SMS comes to town; last year, there were an estimated 1,400 attendees. 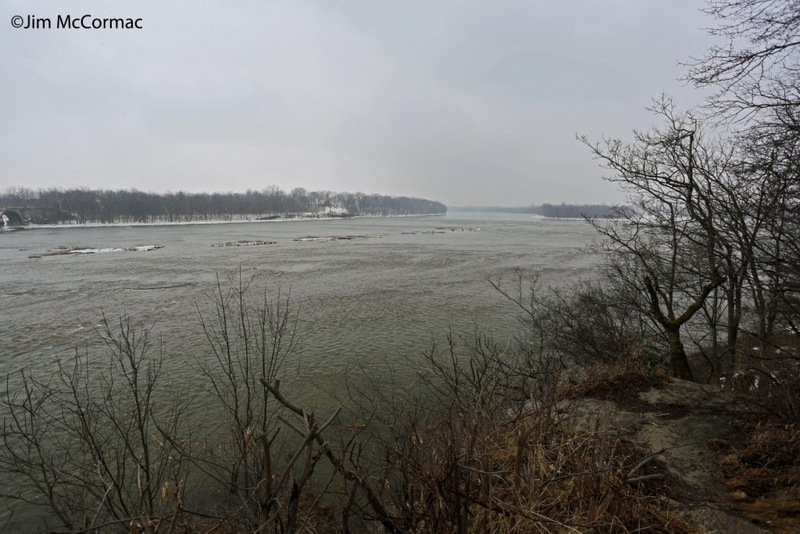 Shreve is ideally suited to host the SMS, in part because it sits on the fringe of one of Ohio's largest wetlands complexes, Killbuck Marsh Wildlife Area. The wildlife area covers nearly 6,000 acres, and is full of life by the end of March. The school in the center of Shreve plays host to vendors and exhibitors, and there will be six talks covering a range of subjects in the auditorium. These programs begin at 8:30 am, and there is a new one every hour or so. CLICK HERE for the agenda. Yours truly will be giving a talk about Lake Erie and its birds and natural history, which is especially apropos as the brand new Lake Erie Birding Trail guidebook is hot off the presses, having just been released last Wednesday. The 220-page book, which is full of color photos, maps, bird-finding information, other natural history facts, and covers 88 sites along the length of Ohio's lake shore, will be available for sale and it's inexpensive! I'm in good company as far as speakers. Chuck Jakubchak ("Chuck-J") will be talking about American Kestrels, Cheryl Harner will discuss birding by habitat, Lisa Rainsong will talk up bird songs and how to better learn them, Kim Kaufman will brief us on the Ohio Winter Bird Atlas, and Kenn Kaufman take on bird migration on a global scale. I found myself in Killbuck and vicinity last Saturday, and saw legions of birds. Killbuck Marsh, with its vast wooded wetlands, hosts scores of Wood Ducks. The open marshes were loaded with diving ducks, with the Ring-necked Duck being especially abundant. Winter has been loath to release its icy grip this spring, and plenty of the wetlands were still locked in ice. As of last weekend, Killbuck was about the northern front lines for waterfowl pushing north. 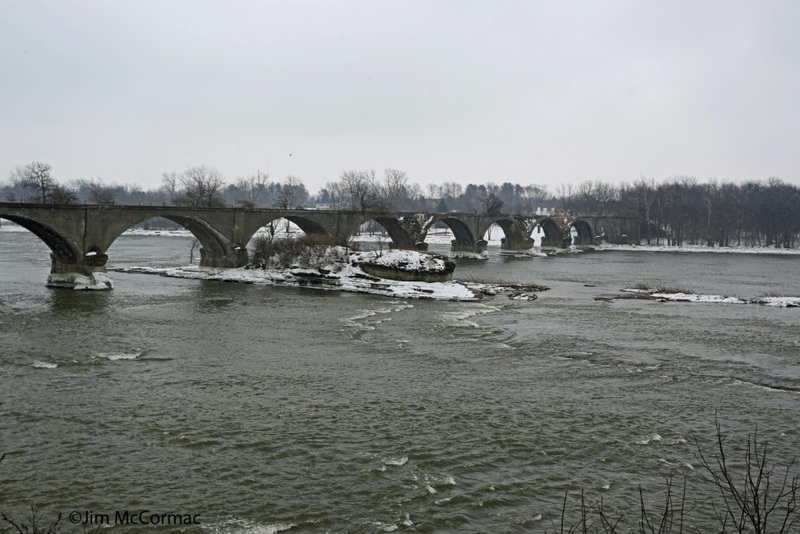 The thaw will certainly be complete by SMS, and visitors can expect big numbers of waterfowl, of just about every possible species. Just a short drive from Killbuck is Funk Bottoms Wildlife Area, another hotspot for SMS attendees. 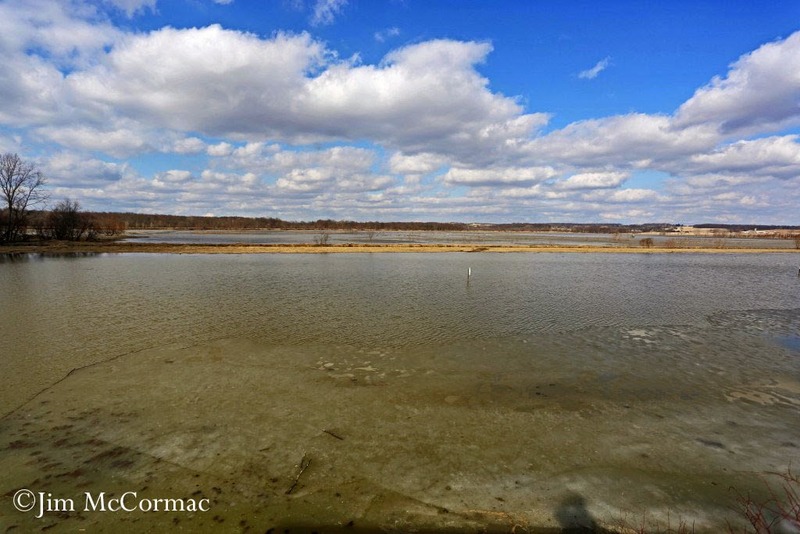 Here, we see the vast flooded valley from the observation deck on the west side of the wetlands. This distant wide-angle perspective fails to reveal just how many ducks, geese, and swans are out there. In the panorama visible from the tower, I estimated there were about 12,000 waterfowl in view. We beam in a bit closer. Look at all those fowl! There were 140 Tundra Swans, scores of Canada Geese, two white morph (MORPH, not "phase") Snow Geese, and at least 16 species of ducks. A Red-necked Grebe wasn't far off, on another part of the wetland. 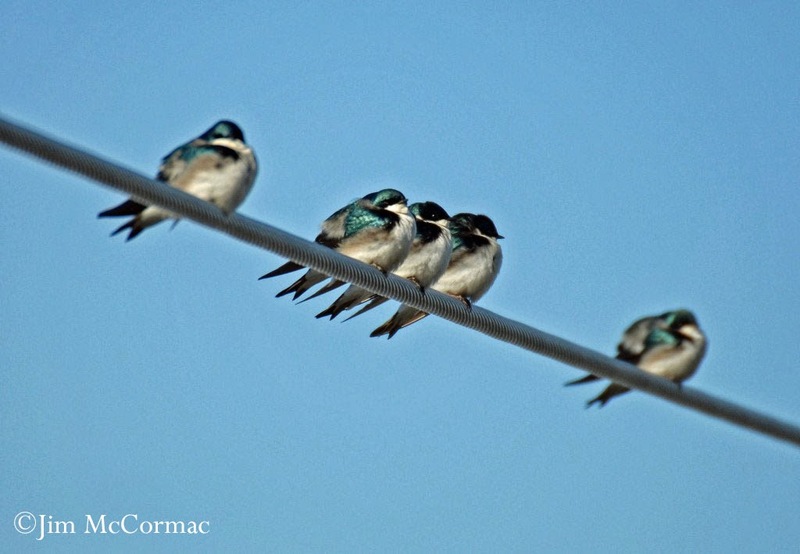 By the time of the SMS, the Tree Swallows will be back in force. I photographed these at an SMS of a few years ago, and the birds were fluffed against 20 F temperatures in the early morning. A quartet of Northern Shovelers wings by, three gorgeous drakes attending a female. Early spring in the marshes is a fabulous time to witness the courting antics of testosterone-fueled drakes as they battle for the attentions of the hens. 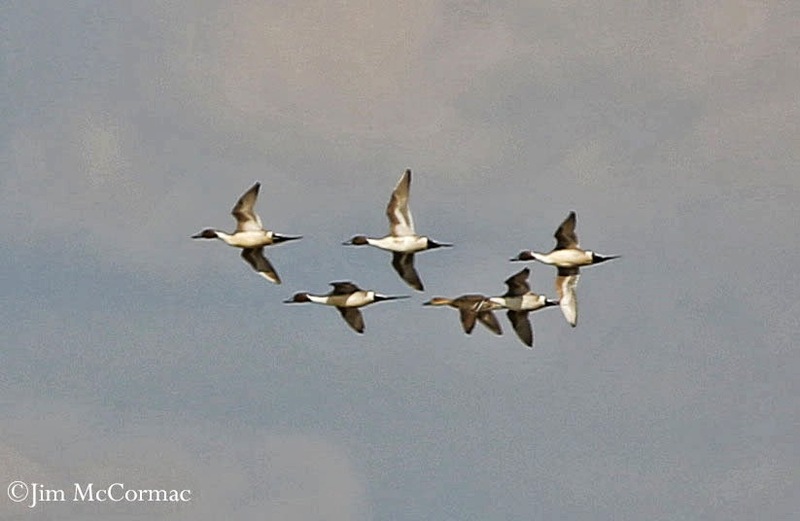 A squadron of Northern Pintails rockets by my camera. Funk Bottoms is probably the most critical stopover site in Ohio for this sleek prairie pothole specialist, or at least it rivals the western marshes of Lake Erie. Pintails were far and away the dominant duck at Funk last Saturday, and I estimated about 8,000 were present. March 29th and the Shreve Migration Sensation is less than two weeks off, and Killbuck and Funk will still be packed with fowl. I'd encourage you to make the scene - you won't be disappointed. For complete details about SMS, CLICK HERE. Toward the end of last Saturday's epic waterfowling excursion to Mosquito Creek Reservoir (that post, HERE), I headed off to check some meadows in the nearby Mosquito Creek Wildlife Area. The habitat looked prime for Short-eared Owls, and they're best found around dusk. In spite of waiting until nightfall, no short-eareds showed themselves, but we witnessed a phenomenon that made cruising around after dark worth the while. While slowly threading the car along some sparsely traveled lanes, I noticed a moth flutter through the headlight beams. Then another, and another. In all, we must have seen two dozen. In warmer months no one would think twice about this, but the air temperature was 36 F! Brisk, to say the least. After seeing a few of these moths, and realizing that some sort of flight was occurring, I had to know what species was involved. Fortunately I had an insect net in the trunk - what self-respecting nerd doesn't carry an insect net? - and we put it to good use. Kristen Beck was also in the car, and with the next moth spotted, I hit the brakes, she leaped out net in hand, and Bingo! Mystery moth in hand. It turned out to be a Morrison's Sallow, Eupsilia morrisoni, and the animal in the photo above is the very one that we captured. After puzzling over it a bit, I turned to BugGuide for expert confirmation and quickly got verification of its identity (thank you, "Novus philonatura!). With a name as a starting point, it was time to learn more about these curious cold weather moths. Flipping to the section on sallows in Dave Wagner's amazing book, Caterpillars of Eastern North America, I learned the following: "This group includes many of our winter moths. All but the Red-winged Sallow emerge in the fall. 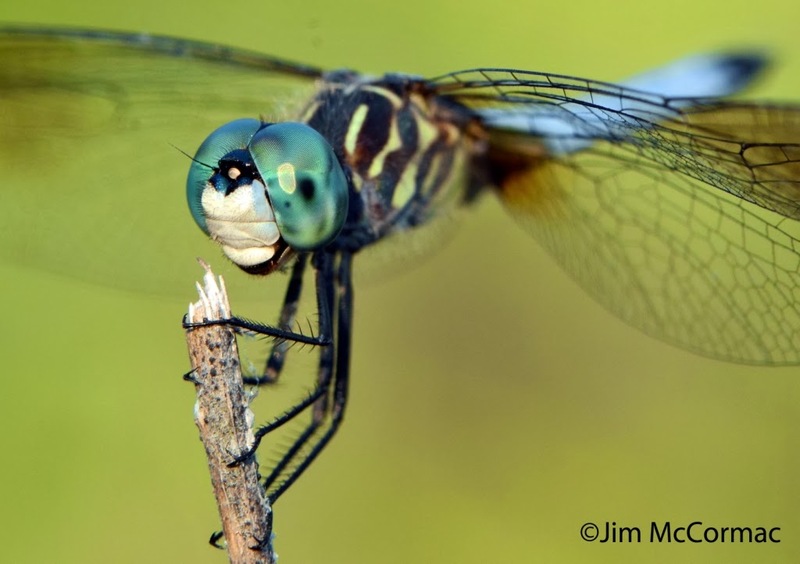 The adults of several genera mate and lay eggs in the fall and early winter; others hibernate, periodically flying on warm nights, but wait until the first warm nights of late winter or early spring to engage in reproductive activities." "Moths that overwinter as adults (like Morrison's Sallow) do so in a sheltered place such as under bark (or loose siding) where it might get quite warm in the afternoon of a winter's day. The high temperature in Columbus Saturday was 49 and the sun was out for part of that and I'd not be surprised if a hideout under south-facing bark reached 70 or warmer. If it gets that warm the moth can do the rest of the work by warming up, "shivering" the flight muscles to raise them to operating temperature (around 90-95 degrees). Then the moth can take flight, and as long as they keep the muscles moving they can maintain flight even at air temperatures below freezing. The "fuzz" on the thorax provides enough insulation so they can keep warm, so they need to find fuel (sap or syrup, or a moth-er's bait). (Yes, researchers worked this all out by installing micro-thermocouples into the thoraxes of moths and recording temperatures of fuzzy newly-emerged moths along with those of older, balder moths." Very neat stuff, and I learned something new about the wide world of moths. Well, here it is in the earliest days of March - the cusp of spring! - but it doesn't feel like it. The temperature is 12 F as I write this. Weather more befitting creatures of the Arctic than bipedal primates that are rather poorly evolved for life in the subfreezing zone. But I bring news of that most fabulous of Arctic wanderers, the Snowy Owl. Reports have predictably tapered off, but I received a small spate of new owls from a few articles that were published about the birds. These reports, alas, were of birds seen some time ago, and are not apparently present anymore at the locales of their initial sightings. I recently saw wildlife rehabber Kristen Beck, and she filled me in a few injured owls that had been taken to rehabilitation centers. At least one of those was fixed up and released to the wild - Go, owl! 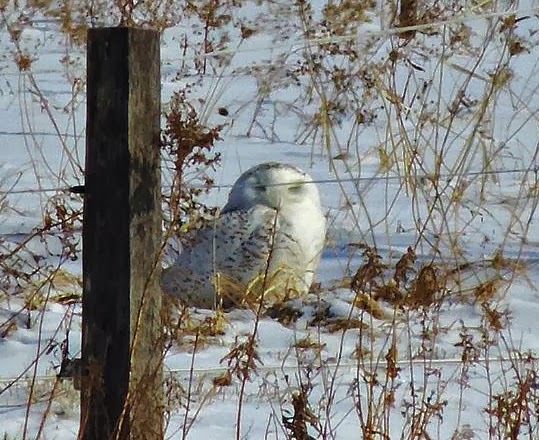 But by far the biggest breaking news on the Snowy Owl front is the nearly miraculous appearance of one in Geauga County! Geauga County, of all places! All winter long, that northeastern Ohio county was a BIG WHITE BLOB surrounded by a sea of red counties (see map below). If you add up the number of owls reported from counties abutting Geauga, the total comes to forty-seven (47)!! But no, none of the birders there could produce even one Hedwig. I don't know, maybe their binoculars needed cleaning. I had taken to tormenting my few friends up there (maybe fewer after this post) about the desolate owless landscape that they called home. But the bleak period in Geauga County ornithological history has passed - THEY HAVE AN OWL! The poor Snowy Owl glares at the photographer from behind a post, no doubt peeved at being found out. Apparently it has been in this Geauga County locale since December. Darn good job of evading the birdwatchers by this sensational hooter, if you ask me. Anyway, to the gist of this post. As of now, we stand at 169 owls reported, from 59 counties. If you don't hail from Ohio, we've got 88 counties, so that's a big chunk of them. And I wonder how many other owls were out there that never got reported. Probably lots. Anyway you shake it, this will probably go down as the largest documented irruption of Snowy Owls in Ohio's history. Some of the invasions of nearly a century ago might have rivaled or exceeded this one, but the numbers were not well documented. The map is below. Look for Geauga County way up in the northeastern corner of the state. It's the county with a numeral one (1). Pay no mind to the fact that it surrounded by counties with lots of owls. I'm sure the Geauga County Birding Association members are out whooping up a celebratory storm tonight, now that they no longer must bear this owlbatross around their collective necks. This is quite literally the Mecca of waterfowling in Ohio right now. We're standing next to State Route 88, which bisects Mosquito Creek Reservoir. The vast lake is frozen solid, as is just about every other water body in the state. For some reason, currents no doubt, a freshwater polyna consistently forms under and on either side of the bridge and do the ducks and other waterfowl pack in here. The village on the reservoir's east side is named Mecca; the burg on the lake's other side is West Mecca. Mosquito Creek is in Trumbull County, way up in the northeast corner of the state. It isn't an area I get to very often, and it's nearly a three hour drive from Columbus. I had been hearing scores of fabulous reports from this lake, and had to experience the scene firsthand. It turned out to be a 16-hour day but worth every minute. I was able to connect with a bunch of friends I don't often get afield with: Tami Gingrich, Dave Hochadel, Kristen Beck, Larry Richardson, Don Keffer and more. We had a great time, and saw lots of stuff, some of which appears in the following images. As is the norm for a late winter/early spring Ohio day, the skies were mostly leaden and gray. I managed the photo above during the approximately 16 minutes of blue sky that we had. I would LOVE to get back here on a sunny day for more photography, but that probably won't be happening. Once the ice breaks up, the fowl will disperse. But we'll probably have another good week or so at this locale, so if you can make the Mosquito Creek scene soon, do it! If you're into waterfowl, a scene such as this will nearly send you into cardiac arrest. There may be nothing I love more in the bird world than witnessing a big congregation of waterfowl in very early spring. Nothing pushes the vernal envelope as do the ducks. An open lead full of birds is a noisy hyperactive scene. The birds are restless, full of the drive to push north and reproduce themselves.The only thing holding them back is cold and ice. They're hot on the heels of ice-out, pushing relentlessly northward as quickly as conditions permit. A tiny sliver of the fowl that were present during my visit. There are five species of waterfowl in this photo, and one very aquatic member of the rail family. As always, you can click the photo to enlarge it. See if you can find and identify them all. A squadron of Redheads prepare for landing. Birds were constantly coming in and out, making for an ever-shifting menagerie. I could have stayed, watched, and photographed all day. And I pretty much did just that. Redheads dominate this frame; it was the most common diving duck present. Several other species can be seen: Canvasback, Bufflehead, Lesser Scaup, and American Coot. In total, we observed 22 species of ducks, geese, and swans (the coots don't count). That's over half of all the waterfowl species EVER seen in Ohio, counting the major rarities. Onlookers were delighted when a noisy flock of Tundra Swans circled the opening. Several of the birds eventually dropped in and hung out for a while. Several of the nonnative Mute Swans were also present, and elsewhere we saw a handful of Trumpeter Swans. The Tundra Swan is our wild, highly migratory swan and this species is about as much a harbinger-of-spring as one could ask for. A quartet of Lesser Scaup almost glow during a brief burst of sunlight. This species was fairly plentiful, but there were only a few of its doppelganger the Greater Scaup. CLICK HERE to see a photo of the latter. A pair of drake Red-breasted Mergansers, the punk rockers of the duck world. Huge and torpedolike, a male Common Merganser wings by. We hit the merganser trifecta, as a couple of Hooded Mergansers were also present. Common Mergansers are massive, and a well-fed one weighs three and a half pounds. Incredibly, this species is a cavity nester. Big as they are, these mergansers are fairly agile fliers to successfully thread their way into a tree hole or nest box. 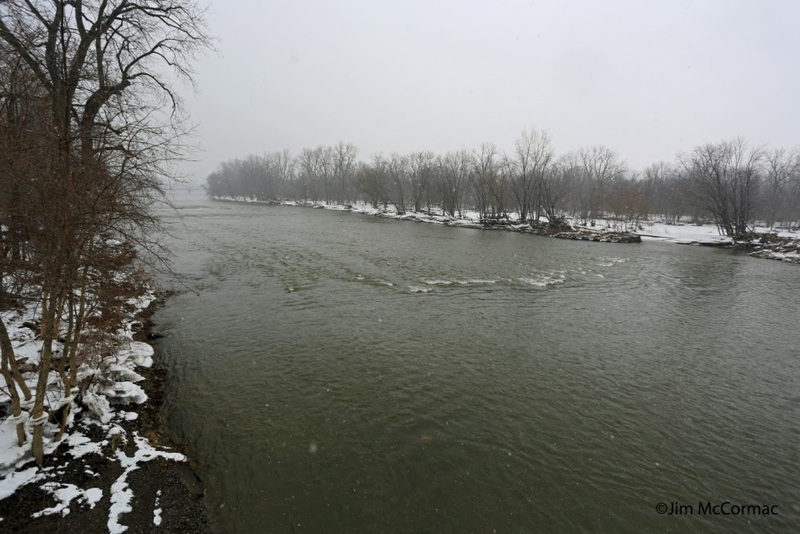 CLICK HERE to read the tale of Ohio's nesting population. A trio of Common Goldeneye whistles in. And I do mean "whistle" - this species makes a loud, distinctive whistling tone with its wing feathers when in flight, and some waterfowlers refer to them as "whistlers". Like the aforementioned Common Merganser, the Common Goldeneye is also a cavity nester. 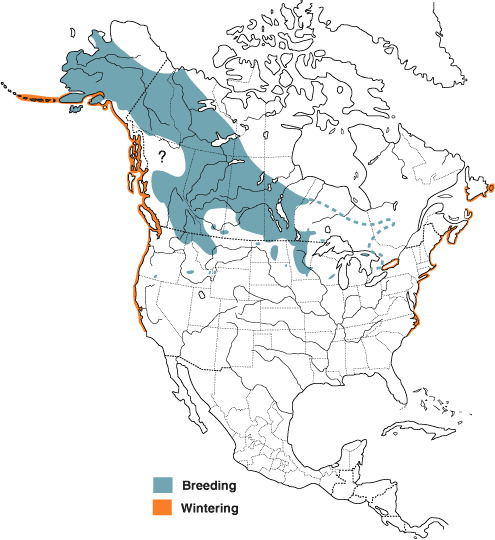 Unlike the merganser, it does not nest in our state, but breeds further north. As a point of trivia, there are seven commonly occurring species of North American waterfowl (although not necessarily Ohio) that nest in cavities: Black-bellied Whistling-Duck, Wood Duck, Common Goldeneye, Barrow's Goldeneye, Bufflehead, Hooded Merganser, and Common Merganser. The species in red were present at the Mecca waters. Getting all seven of these species, with travel allowed to anywhere, on one day, would be a formidable challenge. NOTE: I am excluding the wild Muscovy, a U.S. rarity found only along the Rio Grande River in Texas. A fleet of Common Goldeneye cavorts in the icy waters. Spring has totally sprung for this hardy species, and the males were in full courtship mode. These anatidaean clowns are quite amusing in their efforts to impress the girls. The goldeneye at far right is in the midst of his courtship display. An amorous male swims along, wagging his sizable head side to side, then suddenly throws his bill skyward and kicks his bright orange feet from the water, while emitting a comical squeaking buzz. The females act rather aloof during this energetic display, but it must work - we have plenty of goldeneyes. Ah, the things a guy must do to woo the girl... CLICK HERE for a good video of the goldeneye courtship display. The most famous occupants of the Mosquito Creek Reservoir polyna are these Long-tailed Ducks. There were eleven of them in the house yesterday - ten drakes, and one hen. Here, the less ornate female is escorted by a phalanx of showy males. This species was once known as the "Oldsquaw", a perhaps politically incorrect nod to the males' noisy and rather incessant vocalizations. The ten birds that were here occasionally let loose with their odd howling complaints, and we could easily hear them over the rest of the fowl. Get a pack of thousands of Long-tailed Ducks together, and the din is quite impressive - they can be heard from a mile if the conditions are right. Along with scoters and eiders, Long-tailed Ducks are sea ducks, and most spend the majority of their lives on salt water. Long-taileds are incredible divers, and if conditions call for it, they will dive 200 feet or more in search of food. Ohio and elsewhere in the interior eastern U.S. has experienced a perhaps unrivaled influx of Long-tailed Ducks (and White-winged Scoters). I put forth a theory as to why that might be HERE.